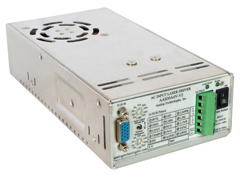 High_Efficiency_AC_Input_Laser_Drivers/Controllers - Analog Technologies, Inc. This series of laser drivers accepts AC voltage input, from 88V to 264V, as the power source. The output voltage fluctuates automatically to keep the output current to a preset constant value. The output current can be set by two ways: internal setting and external setting. The former sets the output current by turning a potentiometer, the latter sets the current by feeding an analog voltage signal to the laser driver through a D-Sub connector. By varying the input analog voltage, the output current can be modulated. Some applications require modulating the output current in digital mode. This can be obtained easily by sending a digital signal to the digital control port of the driver through the same D-Sub connector. In order to know and monitor the actual output current, use a voltage meter or ADC converter to measure the voltage of the LIO port, which is proportional to the actual output current in real time. 1. Over current protection. If a laser diode is driven by a current higher than the maximum current recommended, it will be degraded or damaged. Therefore, we need to know what the maximum current of a laser diode is first. There are 2 types of maximum current specs: maximum continuous current and maximum pulse current. A. The maximum continuous current is determined by the thermal conducting capability of the laser core to transfer the laser core heat to the external heat sink. As long as the laser core temperature does not exceed a certain limit, such as 85°C, the laser is safe. B. The maximum pulse current is the current limit that cannot be exceeded even for a very short time. Usually this current limit is higher than the maximum continuous current. For most laser diodes, the difference is 50% to 100%. However, some laser diodes are designed for pulse -mode operations, such as the LIDAR (Laser Radar), the pulse current limit is hundreds to thousands times higher than the continuous current limit. When setting the current limit on the laser driver, set it to be lower than the continuous current limit, this is because this series of laser drivers works under CW or low frequency mode, not the pulse mode. The laser current can be set either internally by using the internal POT or externally by setting an analog voltage onto the LIS or LISH and LISL ports. The details and guidance can be found in the datasheets. 2. Over voltage protection. If the over current limit circuit develops a problem, the laser diode can be damaged by the excessive current. If we have another layer of defense, such as over voltage protection, the laser diode will remain safe and undamaged. Therefore, our laser drivers come with a voltage protection layer, a maximum output voltage can be preset according to the datasheet of the laser diode or through testing. 3. Shutting off the laser. It is highly recommended to shut off the laser driver output by using the Shutdown port of the laser driver, especially for turning on and off the laser frequently. 4. Control loop indication. The laser driver comes with one current loop and one voltage loop. The former is for normal operation, the latter is for protection. When the current loop works normally, an LED will be lit, it indicates that the laser driver's output current is equal to the set-point output current. When this LED is not lit, it means that the actual output current does not equal to the set-point value. 5. Output noise. The laser driver has primarily three types of noise: 1/f corner noise or called flicker noise, thermal noise, and high frequency ripple noise. A. The flicker noise is in the range of sub Hertz to tens of hertz, and often referred to technology type noise. This is because it is caused by material defects or "roughness". For example, film-based resistors have higher flicker noise than that of the wired wound resistors, due to the fact that the wire is smoother than the film. The reason to call it 1/f corner noise is that this noise magnitude goes up proportionally with 1/f, therefore, the total amount of noise of a region depends on the number of frequency decades, not the actual frequency width. The total noise in between 0.1Hz and 1Hz is the same as in between 1Hz to 10Hz, and thus the same as in between 10Hz and 100Hz. B. Thermal noise for the laser drivers is in the range of tens of Hertz and tens of kilo Hertz. This is because, at lower than the tens of Hertz, the flicker noise becomes dominant, at higher than the tens of kilo Hertz, the noise is very small because the output bypassing capacitors filter out most of the thermal noise, at much higher frequency, hundreds of kilo Hertz, the ripple noise (read below) becomes dominant. This thermal noise is also called "Johnson Noise" (ref. : J.B. Johnson, "Thermal Agitation of Electricity in Conductors." Phys. Rev., pp. 97-109, July 1928), and often referred to as fundamental noise. It is caused by the random motion of the electronic carriers. Compared to the flicker noise and the ripple noise, the thermal noise of the laser driver’s output is much smaller. C. Ripple noise. This is a "man-made" noise and generated by the PWM output stage of the laser driver. The PWM output stage is necessary to achieve the high power efficiency, otherwise, at the high output current, the laser drivers would become too hot for the electronic components to work inside such a small enclosure. We have different types of laser drivers, some have PWM stage switching at a fixed frequency, such as 500KHz, while some others have the switching frequency that varies with the output voltage and/or current. The voltage value of the ripple noise is often between a few mV to tens of mV. If this noise is not tolerable for some applications, a ripple noise filter is recommended to use, see here.